Georgetown took advantage of an uneven start by St. John's and jumped out to an 18-9 lead on a Rodney Pryor three-pointer at the 13:29 mark of the first half. Shamorie Ponds found the touch, with 10 in the first half, and he drained a three to tie at 28 with 4:37 left. 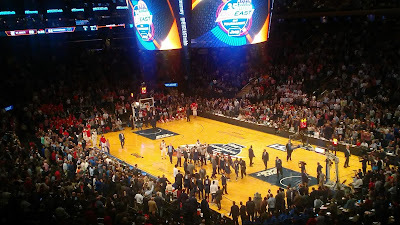 Georgetown was quick to respond, as Pryor made a left-handed dunk along the baseline that electrified the Garden crowd. From then on, the intensity was at a fever pitch, and a fired-up St. John's took a 38-34 lead into halftime. Things boiled over at the 8:35 mark of the second half when Amar Alibegovic of St. John's was called for a flagrant foul on LJ Peak when he put his hands on Peak's shoulders when he drove the lane. Peak and his Georgetown teammates went at Alibegovic and that was just the first brawl. When it appeared things quieted down, St. John's Head Coach Chris Mullin went after Peak, and a Georgetown Assistant Coach also got involved in a scuffle. Both Mullin and the Georgetown assistant were assessed technical fouls. Mullin said of the fight, "I just went out there to see what was going on. I saw Marcus (LoVett) go into the stands. I wanted to make sure he was okay. Everything else just nothing really going on. Close game like that, the whole team is going to lose, their season is over. And I think it was just really competitive juices flowing and towards the end of the game there. But initially I just went out there to see I saw him walk and fall into the stands and that's it. Peak made one of the two free throws that resulted to cut St. John's lead to 59-56. Georgetown pulled it within a point, 66-65, on a Peak layup with 5:04 remaining. St. John's responded with a nice run, going up 72-66 on a Tariq Owens dunk resulting from a Ponds steal with 3:38 remaining. Georgetown got close, but shot themselves in the foot at the free throw line. Peak missed one of two twice in the final two minutes. Bradley Hayes had two free throws with 42 seconds left to tie the game, and he missed one of them, preserving St. John's lead at 74-73. Hayes did the job on the defensive end, as he nlocked Ponds with 15 seconds left. Instead of calling their final timeout, Georgetown raced up the floor, and St. John's Malik Ellison nearly got the steal, but it went off his upper leg out of bounds with 6.6 seconds left. Georgetown's Marcus Derrickson drove the lane, and his shot was tipped by Marcus LoVett. The Hoyas got the rebound, and Peak had a chance, but it hit the back rim and rolled out. St. John's is now 11-1 this season when leading at halftime. Ponds led St. John's with 17 points (5-14 FG, 3-7 threes). It's his 11th straight game in double figures. He's scored at least 10 points in 30 of 32 games this season. This is St. John's first win at the Big Eats Tournament since 2011. Ellison said of what it means for St. John's to win a Big East Tournament game, "Big time win for us. Obviously there's been a huge rivalry over the last 40 years. And it was great that we came together as a team and we got the victory." St. John's took two of three from Georgetown this season, and Mullin said of the advantage of playing this on their home floor, "We played well here as of late. Not last Saturday. But I tell these guys it's nice it's great. The home court advantage is tremendous and the enthusiasm they still have to go out there and perform. That energy and enthusiasm before the game is nice but you have to maintain for 40 minutes especially this time of year. The crowd was great. But more importantly they made big plays when they had to." Mullin said of the slow start in this one and trying to avoid it with a quick turnaround for their next game, "Well, the way we've been playing that wasn't such a slow start. We've had much slower starts than that. But to me we played tough and it's just an old-school type of game. Both teams played hard. As far as the turnaround, like I tell them all the time, get their rest and come out and play." St. John's is now 2-5 all-time vs. Georgetown in the Big East Tournament and has won two in a row in the series. The last win was a 64-59 decision in the 2009 First Round. Ellison said of Mullin telling the players about the rivalry's peak in the 1980s, "We were very aware of the rivalry. Obviously it's a big rivalry. When Coach Mullin was playing they were very physical and they were very competitive. So we just came out here and we really fought for him and we just got the victory."